Move in Ready home in the country. Just west of the St Johns river in East Lake co. Private property on an over-sized lot. 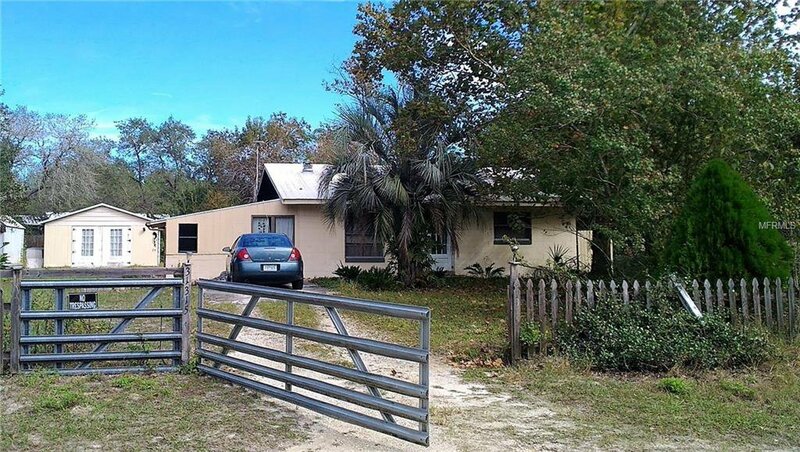 This is 1/3 Acre of Beautiful plants and palms.Concrete block home that features an Open floor plan, large Living room and Eat- in Kitchen and 2 good size bedrooms with laminate flooring. Home has central AC and heat. The bathroom has a stand in shower. There is Quaint Brick flooring in the kitchen which has plenty of wood cabinets and counter top space. The Appliances ( Refrigerator, Range & Washer ) are included. From the door in the kitchen - There is a florida room which is 26 feet long, a Versatile space ( use your creativity ). Large metal workshop ( 25 x 18 feet ) with electric,, plus a storage shed in the back. And for gardeners there is an outside shower in the back.. Surrounded by trees. Only a few miles from the St Johns river, marina, fishing, Camping, Restaurants & bait shop. Call today for a tour. Priced to sell, no HOA or water bills. Room sizes are approximate. Listing courtesy of WATSON REALTY CORP. Selling Office: COLDWELL BANKER PREMIER PROPER.